Following the Re-Distribution Act of 1885, Dover, then a Borough, the representation in Parliament was reduced from two to one MPs and the National Exchequer – now the Treasury – paid the elected representative a wage. In July 1889 Conservative, George Wyndham, stood unopposed and remained the Borough’s MP until his death in 1913. Nonetheless, there was a strong Liberal following in the town, headed by Montague Bradley and Arthur Harby, two local solicitors. Known by his middle name, Augustus Montague Bradley (1865-1953) was the youngest son of John Lade Bradley, Mayor of Dover in 1881. Educated at Dover College, Montague along with his brothers, William and Edwin, held prominent positions in public life of the town for decades. 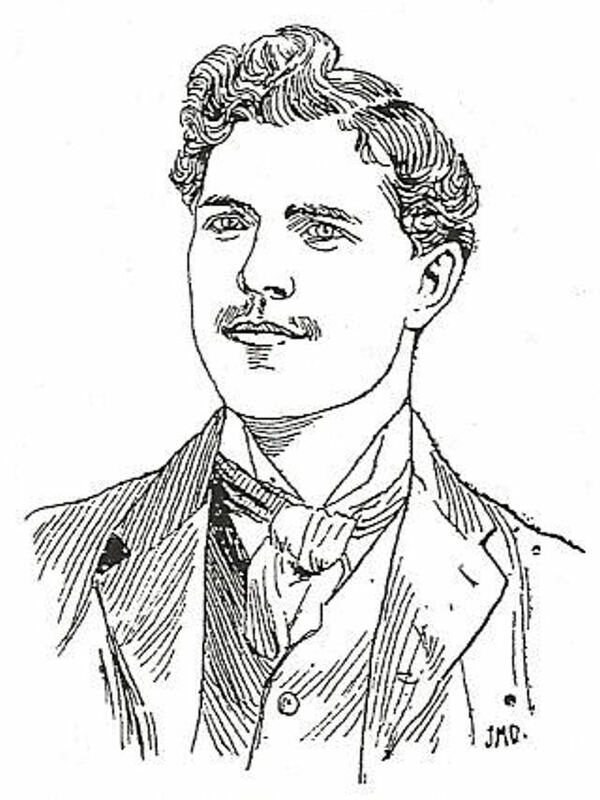 Montague was admitted to the Roll of Solicitors in 1886. His practice was at 6 Market Square – now gone – and he was also active in local politics. In 1892, he was elected as a Liberal councillor and remained on the Town Council until 1918. Arthur Harby (1862-1900), the other solicitor, was in practice at 4 and 6 St James Street – also gone. Born at Snars Brook, Essex, he was taken on as an article clerk, in 1882, by James Stilwell (1829- 1898). Six years later, in 1888, the firm became Stilwell and Harby, by which name it is still know today. James had two daughters, Eliza Amy and Maud Ann, the first married Arthur and the second his brother, Travers Bidder Harby, who was also a solicitor. Arthur was also active in politics and on the Executive of the Dover Liberal Party. In 1892, James Ramsay MacDonald (1866-1937), popularly known by a combination of his middle and surname, was in Dover supporting Major Eustace G Edwards, the Labour Electoral Association (LEA) candidate. MacDonald was the illegitimate son of a farm labourer in Lossiemouth, Morayshire. As a young man, he moved to Bristol and joined the extreme radical Democratic Federation that eventually became part of the Bristol Socialist Society. MacDonald then moved to London gaining employment with Thomas Lough, a Liberal MP, before venturing into journalism. In the meantime, the Trade Union Congress had created the LEA but had entered into loose alliance with the Liberal Party in 1886. 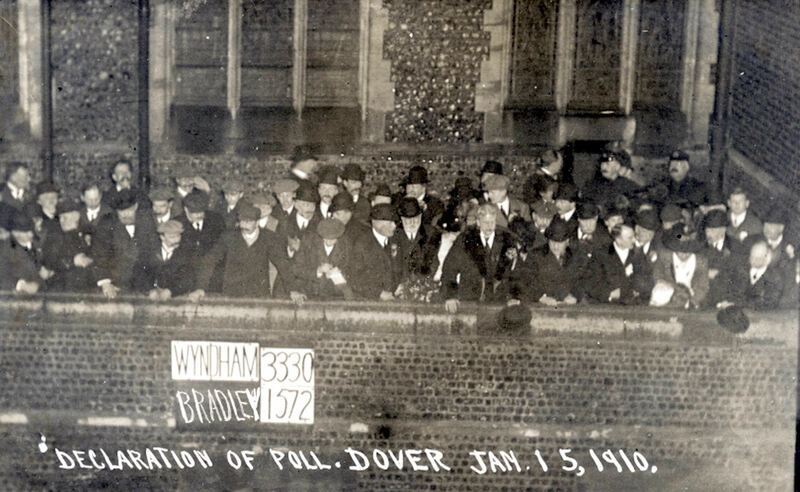 The LEA representative in the Dover 1892 election was thrashed by Conservative George Wyndham 2,231 votes to 978 – the Liberal’s did not field a candidate. In Westminster, the Conservatives were in power but the Liberals were beginning to get the upper hand. Dover’s politics were dominated by thirteen times Mayor, Conservative, Sir William Crundall. Indeed, Crundall’s hold was such that George Wyndham’s role in the governance of the town was that of a figurehead so those who felt that Crundall’s power should be curtailed were impressed by MacDonald. Recognising this, the Dover LEA immediately selected Ramsay MacDonald as its prospective parliamentary candidate. 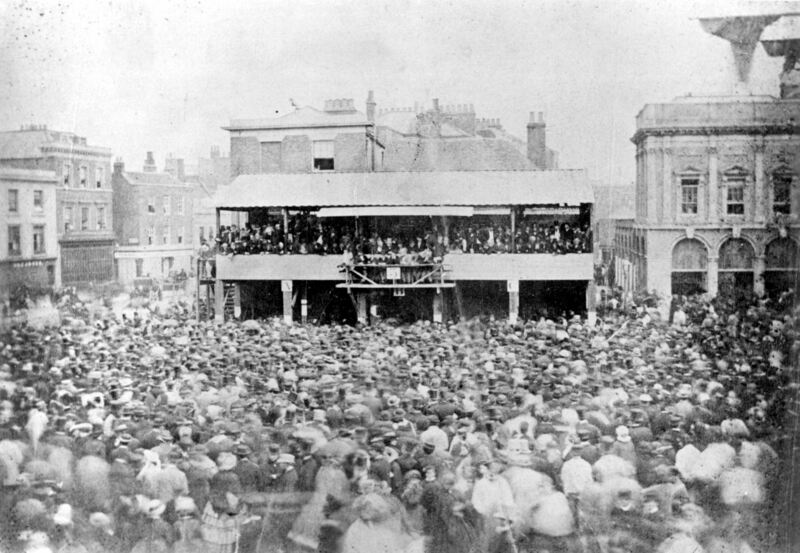 In his adoption speech, published in the Dover Express of 30 September 1892, MacDonald made it clear that the LEA and the Liberals were separate entities, saying that, ‘We shall adopt no shibboleth which will tie us to the old parties.’ However, to have any chance of winning the Dover Seat, MacDonald knew that he would have to join forces with the local Liberals. It was not, however, until the following June that MacDonald wrote to the National Liberal Foundation asking for an introduction to the Dover Liberal Party following which a meeting was arranged with Montague Bradley and Arthur Harby. MacDonald assumed that the meeting was merely formality and dominated the discussion. Not surprisingly, the meeting was not a success and Arthur Harby wrote to the National Liberal Association to this effect. MacDonald was furious, saying that he did not ‘believe that the resolution represents the true opinion of Liberals in Dover.’ Further meetings were arranged between Arthur and MacDonald and correspondence continued into 1894. However, a compromised could not be reached and in the end, MacDonald wrote a terse letter, which was published in the Liberal Dover Chronicle, informing the readers that he was standing in Southampton for the Liberal Party! 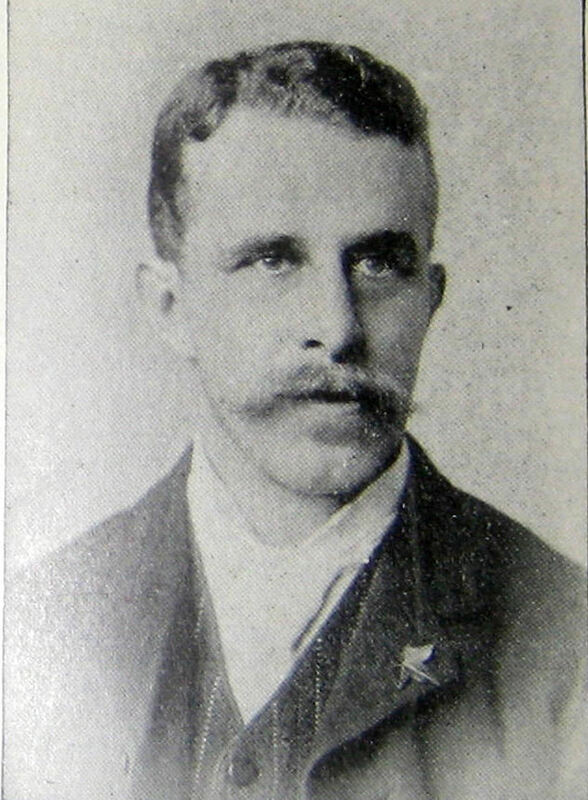 After MacDonald left the town, Arthur Harby turned his attention to his sporting activities, particularly rowing – he was captain of the local club in 1895. He married Eliza on 5 June1897 and was appointed Clerk to the Justices on the death of Eliza’s father. Arthur was also a Major in the Cinque Port Volunteers but tragedy struck while undertaking an inspection at Sandwich on 3 July 1900. He was thrown from his horse and killed, Arthur was 38 years old. Montague Bradley married Hilda, daughter of fellow solicitor, Syndenham Payn, in 1894 and in 1905 joined forces with solicitor Leonard Watson, the practice moving to 22 Castle Street. He continued in local politics and was selected as Dover’s Liberal candidate for the 1910 General Election but was defeated by George Wyndham 3,330 votes to 1,758. On 24 June that year, as Colonel commanding the 3rd Home Counties (Cinque Ports) Brigade R.F.A., Montague was knighted – for his services in helping with the formation of the Territorial Army in 1908. During World War I Sir Montague commanded the 2nd North Midland Brigade. One of his sons was killed in France in 1917. Following the war, in 1920, Sir Montague, Lady Hilda and the remaining two sons emigrated to South Africa and his firm amalgamated becoming Bradley, Chitty and Scorer in Castle Street. When he was over eighty Sir Montague visited England and became an air enthusiast taking flying lessons on returning to South Africa, where he died on Tuesday 9 June 1953. Although Ramsay MacDonald boasted that the Liberals in Southampton had selected him as their candidate, they too turned him down. However, Keir Hardie’s recently founded Independent Labour Party did accept MacDonald for the Southampton seat but he was heavily defeated in 1895. Eventually MacDonald gained a seat in Parliament and became Britain’s first Labour Prime Minister in 1924 and again in 1929. Faced with economic crisis in 1931 he formed the National Coalition, the overwhelming members of which were Conservatives. Accused of betrayal he was expelled from the Labour Party but remained Prime Minister until 1935. He retired from politics in 1937 and died later that year. This entry was posted in Arthur Harby and Ramsay MacDonald, Local Government, MacDonald Ramsay - Dover's MP that never was, Montague Bradley and Ramsay MacDonald. Bookmark the permalink.